Publisher/Date: Listening Library, Random House Children’s Books, c2012. “Precisely why you need to do a better job,” she said coolly. “There’s no evidence that a dragon did it,” she said. “His head is missing!” The prince gestured vehemently toward his own head, his clenched teeth and windblown hair lending a mad ferocity to the pose. Forty years after a treaty was drafted and agreed upon, relationships between the dragon and human populations are strained at best. When the human Prince Rufus is murdered in a draconian manner, all eyes turn to the dragons. Dragons, who can assume the physical appearance of humans in order to interact with them, are being taunted, attacked, and held under suspicion. With the treaty anniversary approaching and official dignitaries from both sides meeting, Seraphina is kept busy as the newly hired music assistant. But her close, long-time friendship with a dragon puts her in a unique position to understand their analytical, emotionally detached way of thinking, and Seraphina quickly finds herself aiding Captain/Prince Kiggs in his investigation. They’d better act fast though, as the dragons and humans are meeting soon, and there may be a murderer in their midst with plans for more mayhem. What can I say about this book that hasn’t been said already? I’ve tried really hard to avoid all the praise that has been heaped on this debut novel, but it’s almost unavoidable. Even the cover is stamped with praise from such big names as Christopher Paolini, Tamora Pierce, and Alison Goodman. I truly fell in love with this book, and the audio was excellent from start to finish. Yes, the dragons might be the stereotypical unemotional beings, but Hartman does manage to add depth to the dragon characters’ rationality, even though feelings are treated like the plague for their kind. If I remember correctly, I compared the story to someone as if Star Trek Vulcans could fly and were plopped down in Renaissance court, something of a Spock meets Shakespeare. The language is beautiful, the setting has depth and breath and, since Seraphina is a music teacher, sights and sounds come alive. Hartman has created a world with social and cultural background, from a full pantheon of diety-like saints and court etiquette to navigating political turmoil and espionage. Mandy Williams does an excellent job with her voices and has the inflection spot on, in turn emphasizing the emotion of the humans and the reserved nature of the dragons. I really appreciated the choice to have Justine Eyre contribute (I won’t say in what way) because it clearly separated those two narrators and indicated the shift to readers. I have to feel sympathetic towards Kiggs because you know by the end of the book he has some of this figured out and he’s just trying really hard to ignore the obvious inconsistencies of Seraphina’s personality. What a personality Seraphina has though, it’s no wonder she makes friends so easily. She’s very likable in her naive sort of way, which aids her in convincingly lying when necessary to aid her in treading that fine line between navigating and mediating for the two distinct worlds. She’s got a quick mind that is showcased throughout the book, something we don’t really see in strong female protagonists very often who are usually too busy trying to save their own skin or getting involved in some sort of love triangle. 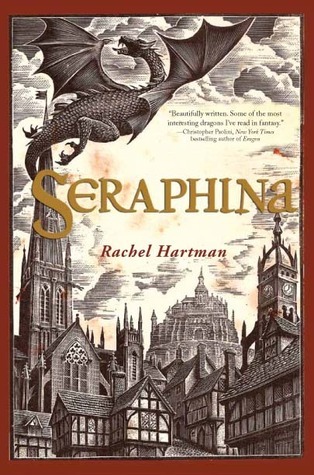 Seraphina does both at some point throughout the story, but it’s not the whiz-bang action but more a thinker novel. If you’ve seen the newest version of True Grit, I view her as very comparable to Mattie Ross (the little girl) in regards to her wits, intuition, and tenacity. There were two things that I do have to complain about though. At the very end with the scene between Kiggs and Seraphina, I kind of wish that had gone differently, just because they have an amazing friendship that is built over their mutual collaboration and admiration for each other. Seraphina’s humanity and her struggle to find her place in the world really ring true, with the author exploring some topics that some teenage girls are faced with in terms of self-acceptance. The other thing that fell flat for me was Seraphina’s “mental imaginings” (what would you call them without giving them away) until you figured out what they actually were. Then they just struck me as massively convenient. As in “REALLY? You just did that because you’d backed yourself into a corner and needed somewhere to go with this, so you added this stuff to make it work.” I think the story would have been much more interesting and Seraphina much more relatable if she didn’t have this mental block hanging over her head and she didn’t have all these clues to fall back on. Isn’t one distinguishing aspect of her enough, now she’s a freak of nature? I hope this makes sense to people who have read the book. Both of those things played a very small role in the book, and while I think they’ll later have a larger impact on my appreciation of the series, it should by no means detract from anyone’s enjoyment of this book. I’d heard good things about this book, but the real reason I finally made an effort to snag a copy was that it was named a finalist for the Morris Award, YALSA’s award for a work of young adult fiction by a debut author. YALSA’s blog The Hub has issued a challenge to readers everywhere to finish the finalists before the award is announced next week. Go check out the Hub’s interview with Rachel Hartman that they just recently posted, along with information about the challenge itself. It’s also a Cybils finalist for the Teen Science Fiction and Fantasy category. At least take a look at this book before the sequel, titled Drachomachia, is released this fall.